Chiptunes are songs — or song data — usually designed to be played back by a specific sound chip with limited capabilities. The sound is often associated with early Video Game and computer systems, though many early synthesizers also often contain similar (or even the same) sound chips. While the term may apply to old or antiquated hardware, it is not specifically exclusive to game music or old songs. Many have repurposed game hardware, and even the sound chips contained inside, to build inexpensive instruments or synths. Nowadays however, chiptunes are only used by stylistic choice. So, while some might consider Chiptunes to epitomize the overuse of synthesizers typical of Eighties Synth-Pop, other listeners consider them a way of demonstrating the composer's mastery over a limited electronic instrument, and likewise many of those composers enjoy that challenge. Fans and composers of the genre will be quick to point out that the resulting sound is the entire point of writing such tunes. Like any music played by a computer, Chiptunes are mathematically perfect, and it's probably a combination of this perfection with a touch of nostalgia that their fans love. 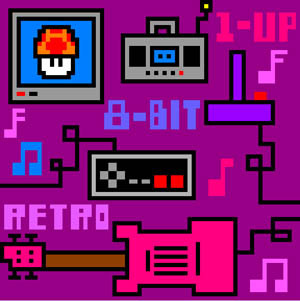 Chiptune music is a widespread genre, beloved by many on the Internet, but hasn't really reached mainstream status yet. Despite that, Electronic music in general has been heavily influenced by Chiptunes (mostly classic ones from Video Games in the 80s), and in recent years mainstream music has shown more and more Chiptune influence. It has reached a point that truly distinguishing between chiptunes and some subgenres of electronic music such as Techno and Glitch is becoming increasingly difficult. An interesting quirk of Chiptunes is that they come out either sounding awesome or like crap, and there is generally no middle ground. And on the listener side, well, you'll either think it's great, or you'll think it rubbish. On the other hand, though, depending on what kind of listener you are, you may also think it doesn't interest you OR it has one flaw among the other awesome aspects of composition OR the Capcom's monkiers have become too old and such, so decide for yourself! Another interesting quirk that chiptunes share with General MIDI is that they can be stored in numerous native formats that take up very little space. A full song can be stored in around 10 kilobytes, compared to perhaps 10 megabytes for an MP3 file. This makes them the ultimate in bandwidth friendly music, particularly if you are stuck on dial-up Internet. A distinct sub-genre is Keygen. Keygen arose out of a simple way to show that someone had devised a program to generate a key for an illegally downloaded program, and the music came as a form of signature. However by its very nature as existing as a bonus rather than a form of music, it's less known, though its influences (namely a much more flowing style and slurred notes) have noticeably seeped into the mainstream chiptune scene. And lastly, if you have 20 year-old hardware, fear not! By their very nature, chiptunes are designed to be replayed on something old. Even replayers that emulate the sound chips tend to require very little in the way of resources. It should be no surprise, because of this, that Chiptunes (especially in tracker form) have long been a staple of the Demoscene and continue to be so to this day. Thus, a lot of chipmusic is available online for free. Somewhat-purists that at least want to write or hear music that is possible on the sound chip in question. Examples: MOD/S3M/XM/IT (tracker) files utilizing carnal knowledge of a specific sound chip. Sometimes also referred to as "Fakebit". A more extreme version of Fakebit, which utilizes chiptune sounds but pays no mind to what is actually possible on a sound chip. Sometimes also referred to as "riptunes". Examples: improper use of the Triforce MIDI plugin, "8 Bit Remixes" made with GXSCC that are very popular on Youtube, or compositions designed to simulate two consoles running at once. Composers or bands that utilize chiptunes as one of the many elements in their music. This can range from using a sound chip in combination with a rock guitar, to using only a sound chip and drums. A word of warning before you go hunting for Chiptunes: the good ones tend to be Ear Worms. Atari produced custom chips called TIA and POKEY. The TIA was found in the Atari 2600 and Atari 7800, and it also drove graphics. The POKEY, which did Potentiometer (rotary paddles) and Keyboard handling, was in Atari 8-Bit Computers, the Atari 5200, various Arcade Games (some even used two or four), and even some 7800 cartridges as expansion sound. The NES, TurboGrafx-16, and Game Boy, where sound generation is built into each system's custom CPU. The Famicom Disk System was also capable of primitive FM synthesis. General Instrument AY-3-8910 : Amstrad CPC, Atari ST, Intellivision, MSX, Vectrex, ZX Spectrum 128K. Many early 1980s Arcade Games used two AY-3-8910s; the Gyruss arcade board had five. Texas Instruments SN76489 : Colecovision, BBC Micro, Sega Master System, Game Gear (with added stereo support), Neo Geo Pocket (another stereo variant), IBM PCjr and many PC clones (e.g. Tandy 1000) claiming "3 voice" sound. Called TMS9919 when Texas Instruments first used it in the TI-99/4. MOS Technology SID : Commodore 64 in two variants, the 6581 and 8580. OPM : Sharp X68000, numerous Arcade Games by Atari, Capcom, Irem, Midway Games, Namco, Sega, etc. The websites 8bitcollective and 8bitpeoples contain many examples, including some from bands listed here note Collective is more about single songs, and artists will generally upload songs to get feedback from other artists, while peoples focuses on album releases. Ubiktune is another site that releases albums. OC Remix is heavily associated with the Chiptune scene as well; however in general they tend to make instrumental versions of originally Chiptune songs. Bit Shifter , who also helps run 8bitpeoples. chipzel, best known for creating the soundtrack to Super Hexagon. Hertzdevil , who uses LSDj as one of his tools. His most prolific album is the MEGA ZUN collection. Some members of the Homestuck music team; though not all of them. Toby "Radiation" Fox is the most noticeable. I Fight Dragons, a mixture of rock and chiptunes and an all-around nerdcore band. Information Society's remix/cover of Devo's "Beautiful World." Janne "Tempest" Sunni, famous for a legal scuffle with Hip-Hop producer Timbaland, over an uncleared sample of his song "Acidjazzed Evening." Listie used to upload "MIDIS shoved through GXSCC". Neil Landstrumm's Bambaataa Eats his Breakfast album combines this with dubstep. Magnus Pålsson, aka SoulEye, best known for composing the soundtrack for VVVVVV. 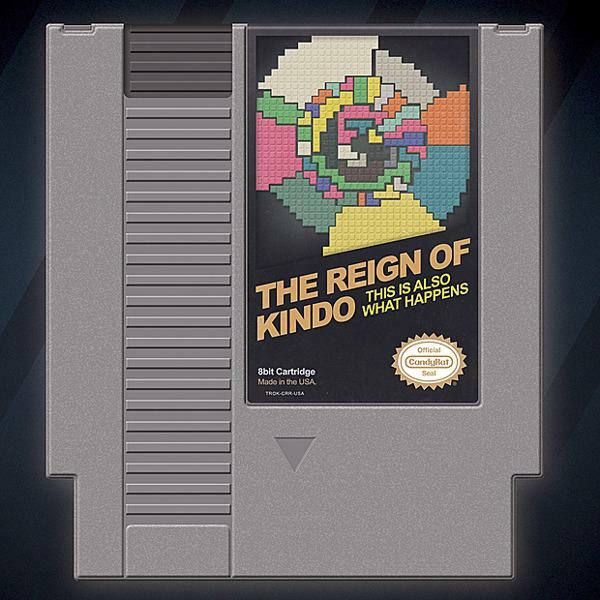 The Reign of Kindo, normally a jazz-influenced indie rock band, made the last-minute decision to record "8Bit Remixes" of every track on their album This Is What Happens, and release it concurrently under the title This Is Also What Happens. Just one look at the cover ◊ tells you what you're in for. Sabrepulse , barring two E Ps. In turn, Hertz Devil has produced a series of 8-bit PSG Touhou remixes, collectively known as Mega ZUN after Mega Man.